‘The Garden City’ and ‘More English and than England’ – these are the most popular adages spouted whenever the city of Victoria is mentioned in conversation or tourist brochures. While British Colombia’s capital city is truly blooming with flowers and ornate, historic architecture rarely seen on that side of the Atlantic, Victoria’s coastal scenery, quirky villages and craft beer scene should also be included on any itinerary. And with so many of the city’s attractions sprawled across a wide area, bikes are the perfect way to see the city’s attractions. Check out the video above to check out my suggested itinerary, or read more below! Bike rentals are plentiful in Victoria, but if you are fresh off the boat as we were, then Pedlars is in close proximity and fairly economical. Prices are set according to how long you have the bike out the shop for, and city, hybrid and mountain bikes, as well as those adorable tandem bikes, are available to rent. 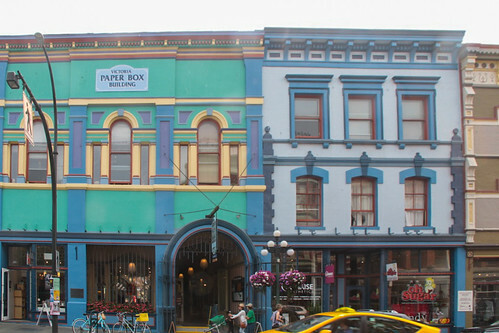 Victoria’s most colourful (and touristy) village is kitschy, colourful and cute as a button. 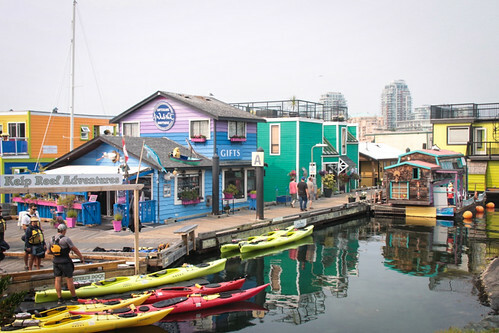 While a variety of food stalls are available for light afternoon bites alongside whale watching tours and kayaking trips, the main attraction here is wandering down the streets of ‘floating houses’. Forget any connotations of Waterworld, this development has all the comforts of ordinary homes, and each owner has left their own unique mark on the exterior design of each house. This port is the calling point of most of the cruise ships in the area. 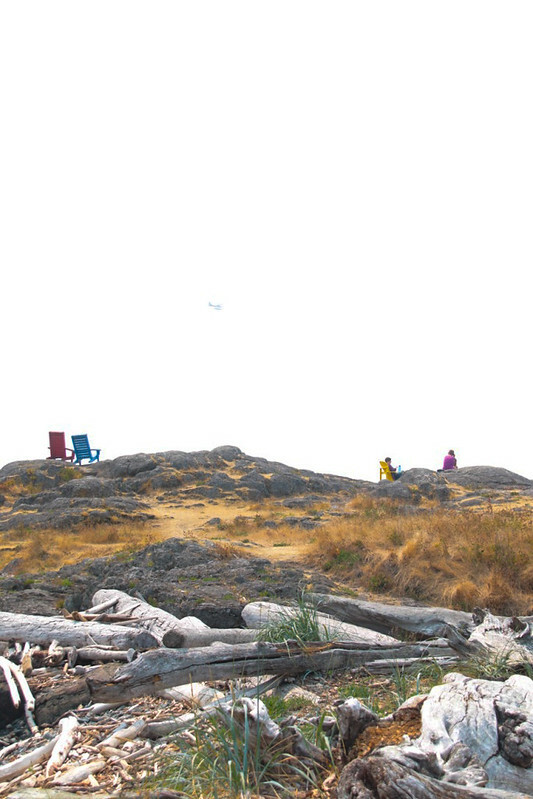 For scenic ocean views, not to mention the opportunity to spot wildlife such as adorable sea otters, take a short rest at this point. Arguably one of the most scenic spots around Victoria, this scenic view is the perfect spot to sit back and look out for dolphins and whales. Victoria is teeming with gardens and floral displays. While most visitors to Victoria flock to Butchart Gardens, Abkhazi Gardens is worth a visit for its striking ‘natural features’. Plus, a visit to these gardens can easily be squeezed between other sightseeing. Take a rest of the shore and keep a keen eye out for the dolphins, whales and seals that frequent the waters around this area. Oak Bay Marina a good spot for a toilet break, and Victoria’s Oak Bay village is nearby. Cruise down Oak Bay Avenue on your bikes and explore the myriad of quaint coffee houses, restaurants and shops lining either side. 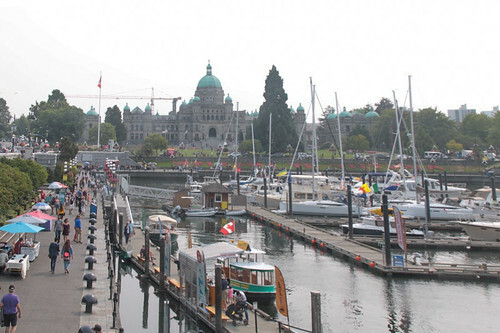 European architecture, seaside setting and a lively craft beer scene – Downtown Victoria is the perfect destination to finish the cycling tour. Make sure to pay a visit to the British Columbia Parliament Building, The Empress Hotel, and wander down the main streets of Down Victoria to see its vintage American-inspired architecture. Canada’s craft beer scene here has exploded in recent years, and there are a number of pubs, not to mention breweries, such as Phillips, where you can have a celebratory drink after cycling, and try some of the local fare at the same time.